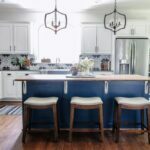 I recently took a little DIY road trip back home to Louisana to add some finishing touches to a family member’s kitchen. 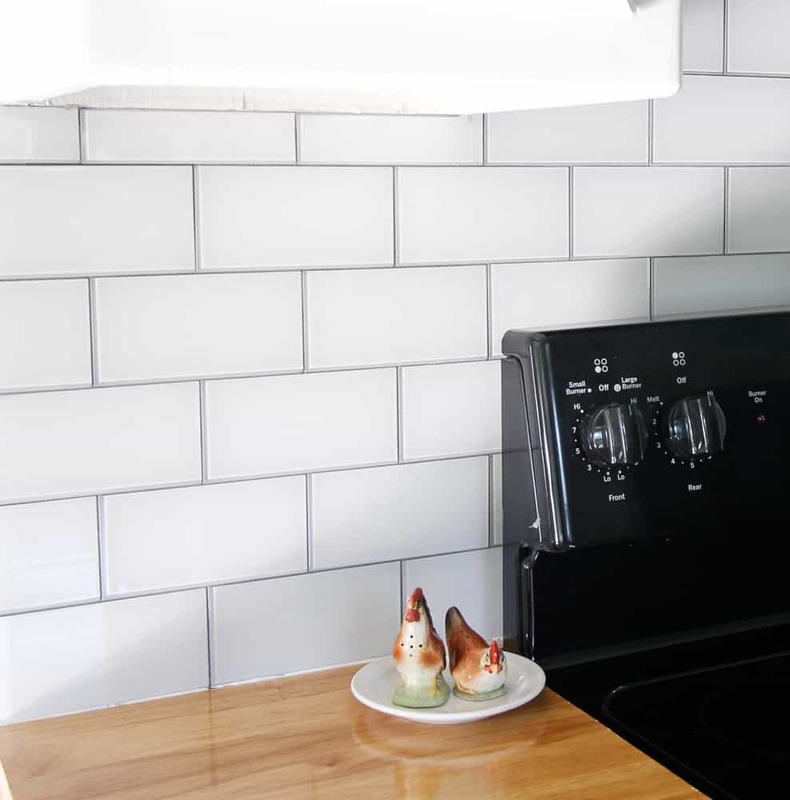 A beautiful glass peel and stick tile backsplash was just what this kitchen needed. 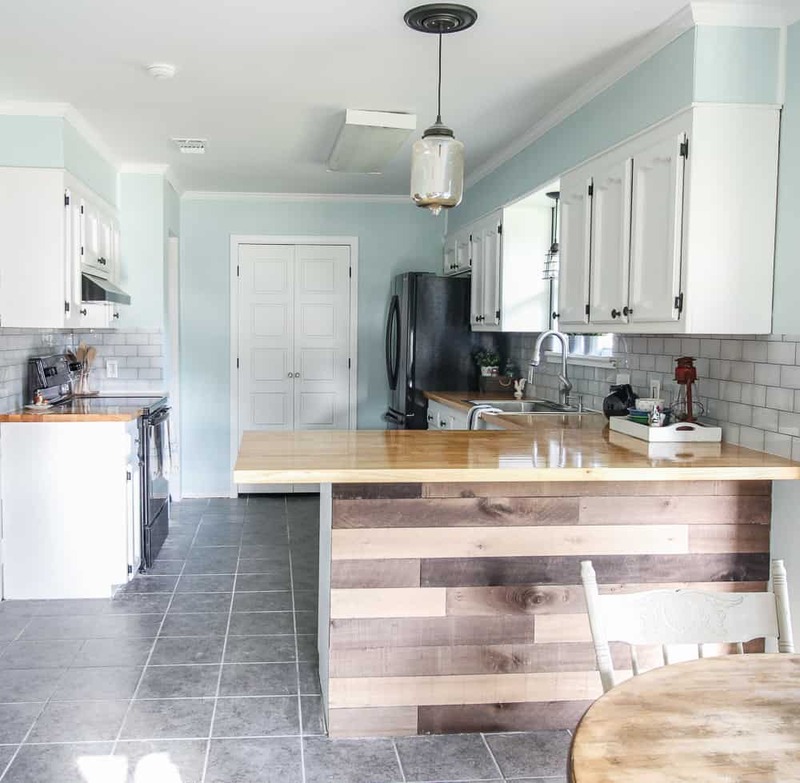 When we were home over Christmas break, I vowed to make a trip back to Louisiana this summer and help her finish up her kitchen and she was thrilled! I was even more thrilled when Aspect Peel and Stick tiles offered their support of the project. They generously donated the tile. This post is sponsored by Aspect Peel and Stick Tile, all opinions, photos, and designs are my own. This post also contains affiliate links for your convenience. So let’s get a look at the before, which is really her ” thank goodness it’s almost done” photo. 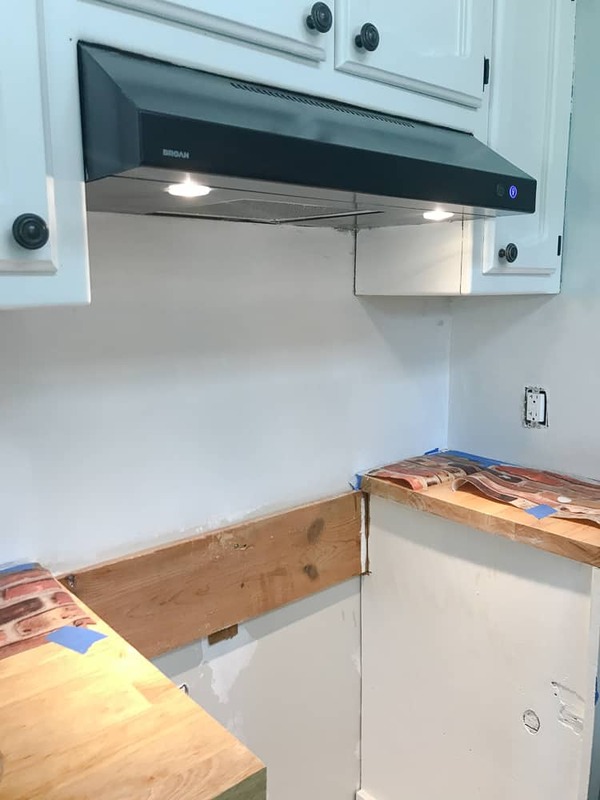 She was able to have friends install a butcher block counter, and not afraid of a little DIY herself, she applied the finish. 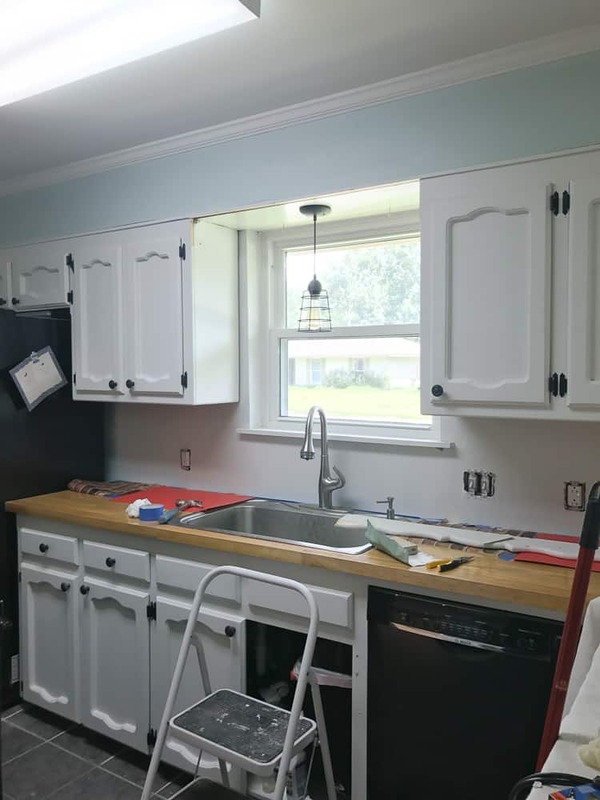 She also painted the cabinets. Clearly, she was well on her way to one good-looking kitchen. 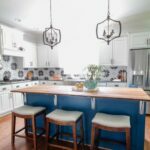 But a backsplash is like the perfect accessory added to a plain dress…and it certainly makes for a more beautiful kitchen. 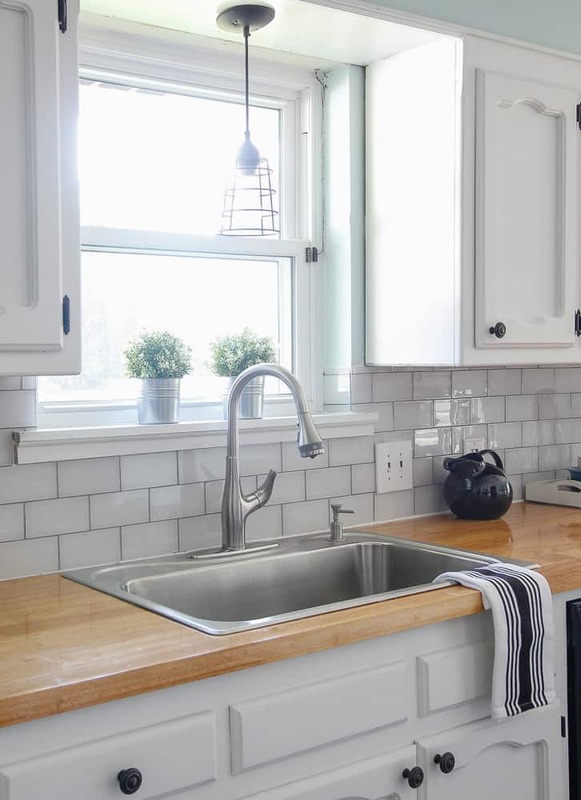 Having a subway tile backsplash in her kitchen was always her dream. 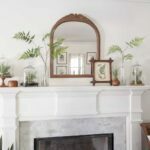 A dream she certainly wasn’t sure would come to fruition with all of the other expenses incurred while rebuilding her home. 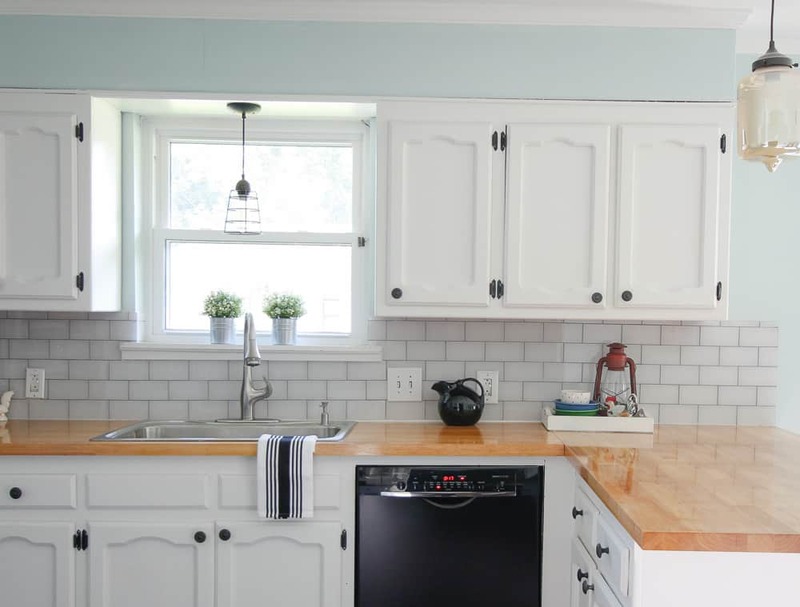 The white glass tile has a lovely glow and shimmer that adds the perfect amount of sparkle to her kitchen. We decided to install the tiles with grout like most traditional tile installations. With Aspect Tile it is not necessary to grout, the tiles can be stacked, butted right up against each other. 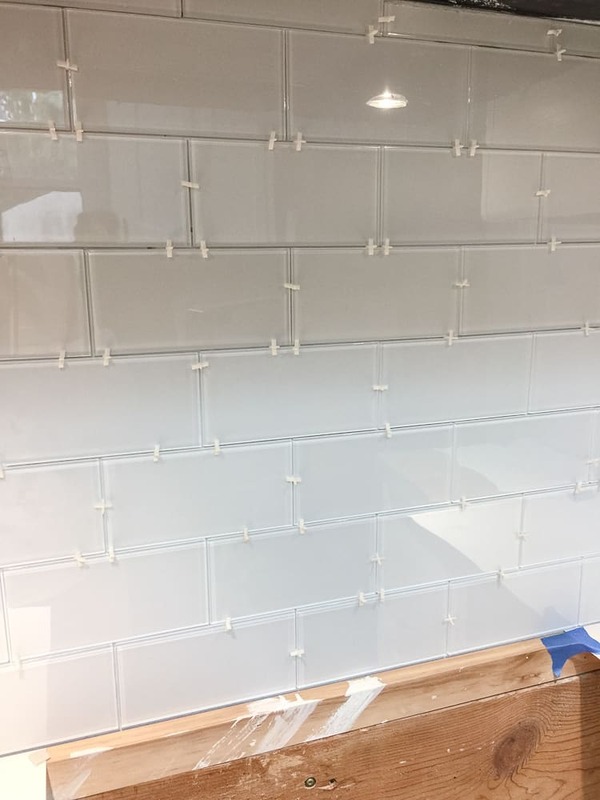 However, installing the peel and stick glass tiles with the spacers and grout gives it a more classic look and suited her style perfectly. We chose a medium gray mortar to coordinate with the darker hinges and tile floor. Installation was very, very easy. No mortar required. Just a clean, smooth, primed surface. Here’s what I love about this product. 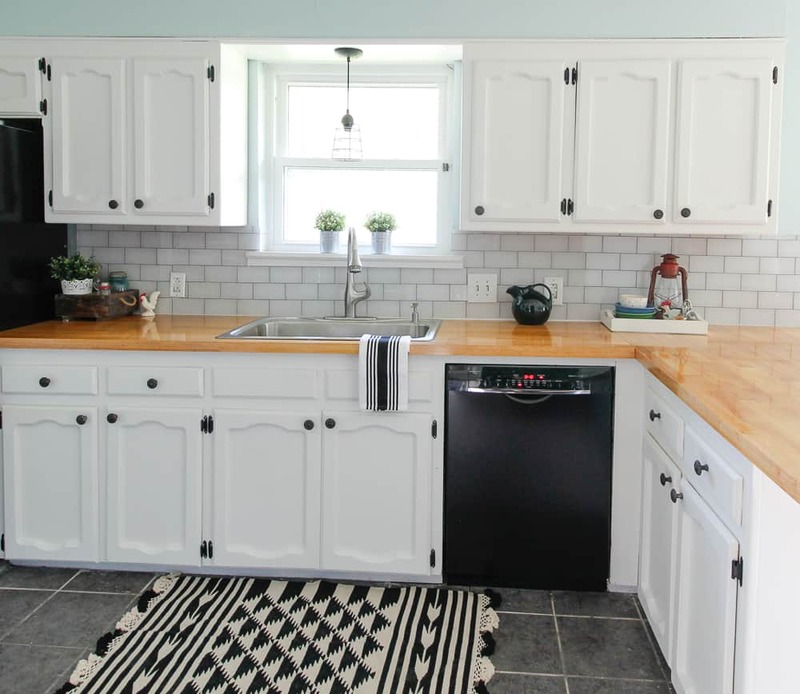 Let’s say you have an ugly, dated backsplash. 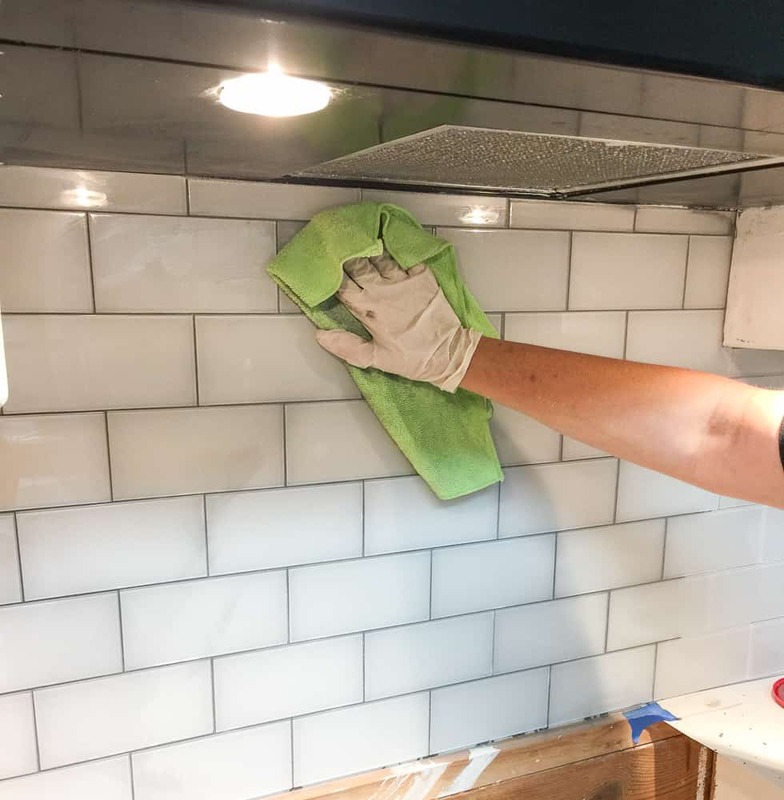 You can clean the tile really well with isopropyl alcohol (follow the directions carefully) and apply the peel and stick tiles right on top! No demo, no mortar just a fresh new look without all the hassle! Sounds like a perfectly simple project anyone can do! 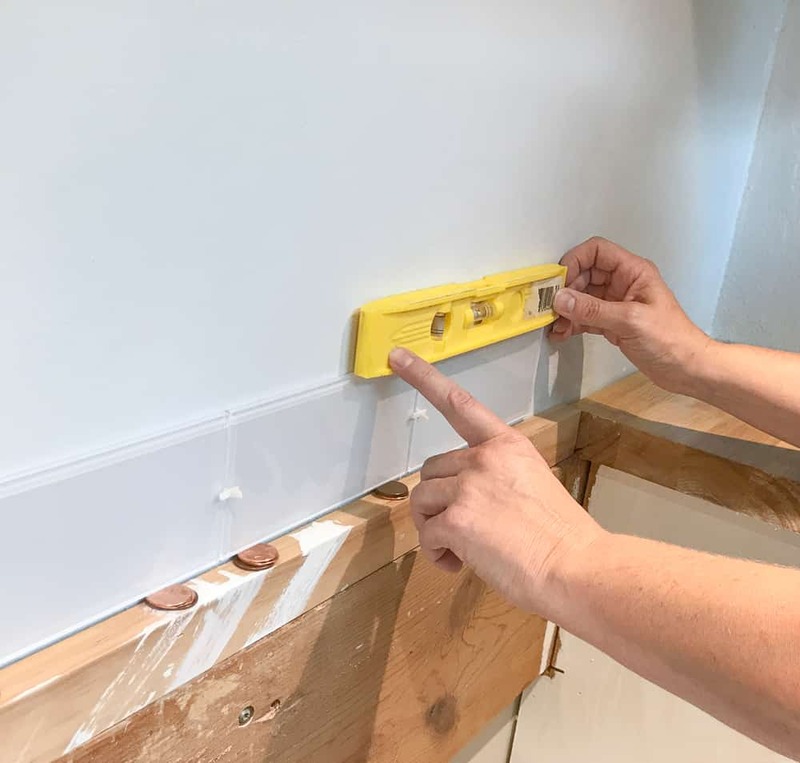 In this case, her drywall installers had added texture to her backsplash so we sanded and primed the surface before starting. 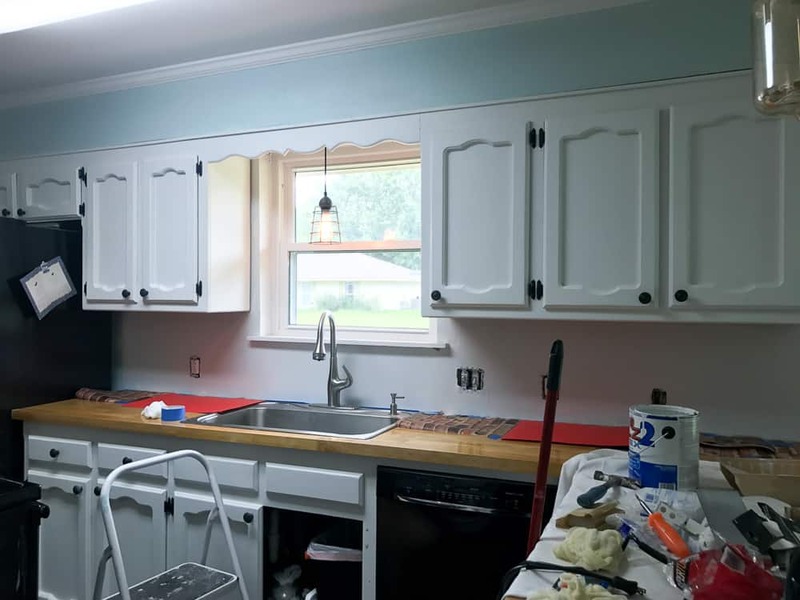 While we waited for the paint to dry, I asked her if I could remove the scalloped wood valance above her sink. Thankfully, she said yes. Immediately after knocking it down, the amount of sunlight that flooded into the room was quite remarkable. All we had to do to was cover the blank transition with a piece of mullion trim. She said she knew it was dated but was fearful of what it would take to get it down and fix it back up. Turns out all it took was several good wacks with a hammer, a little trim, and paint! Be a little more fearless my friends! Ok, so let’s get to the step by step tutorial because I feel like you want to know how easy this is! 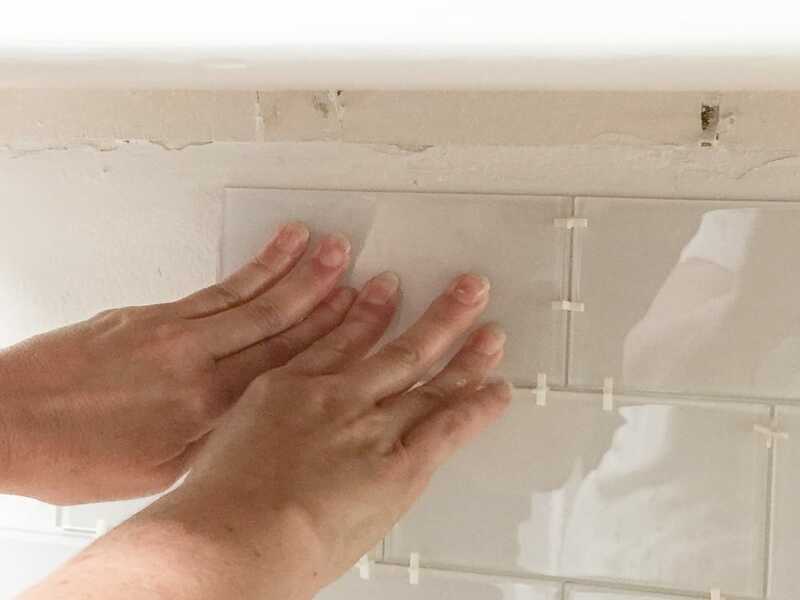 While this is always the most important step of any project because the peel and stick tiles need to be adhered to the surface, a clean, freshly primed surface is vital. Initially, we were concerned the tile wouldn’t stick well to the bit of texture still left after sanding so we began by using construction adhesive. After working with the tile for a while, we realized the adhesive on the back was doing a very fine job on its own. The tiles were not coming off, even with more than a “bit” of force. Start with a level line either on the end or the center. 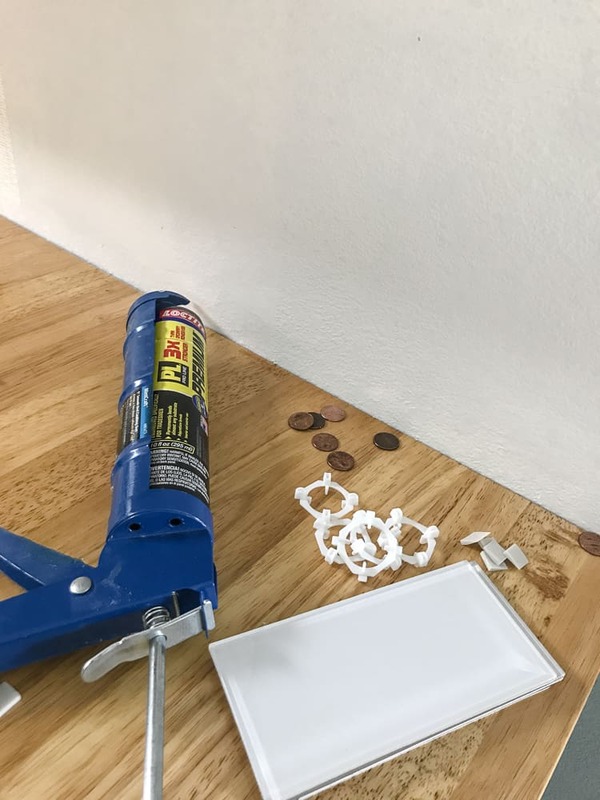 Use spacers or pennies on the counter. 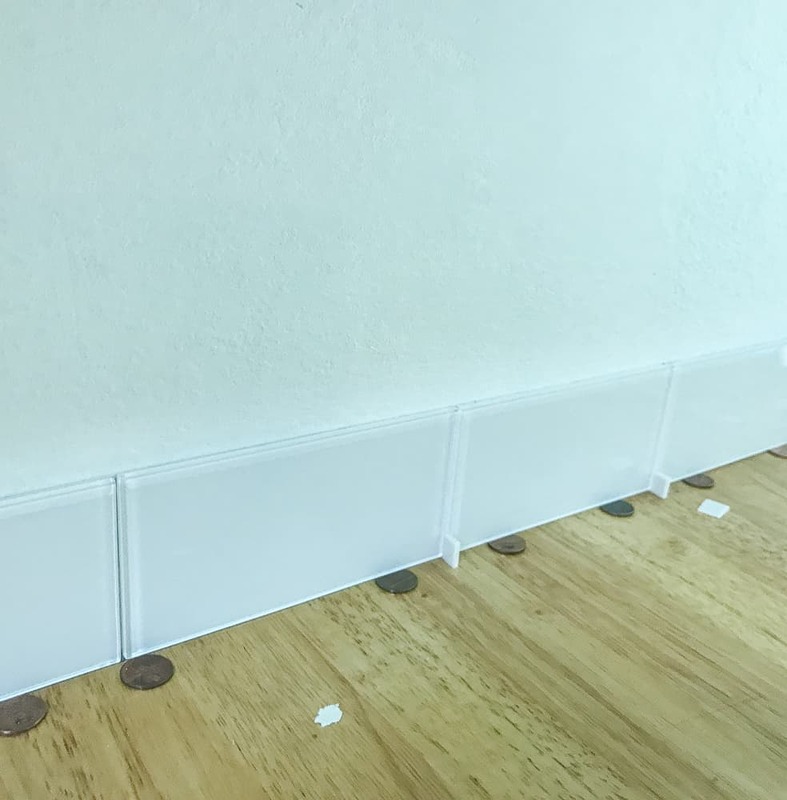 Place the bottom row of tiles on pennies to create a level surface and a very small gap for caulk. As you move along on the first row continue to check that the tiles are level from one to the next. I had to add pennies as I went because I failed to realize the counter was off level. 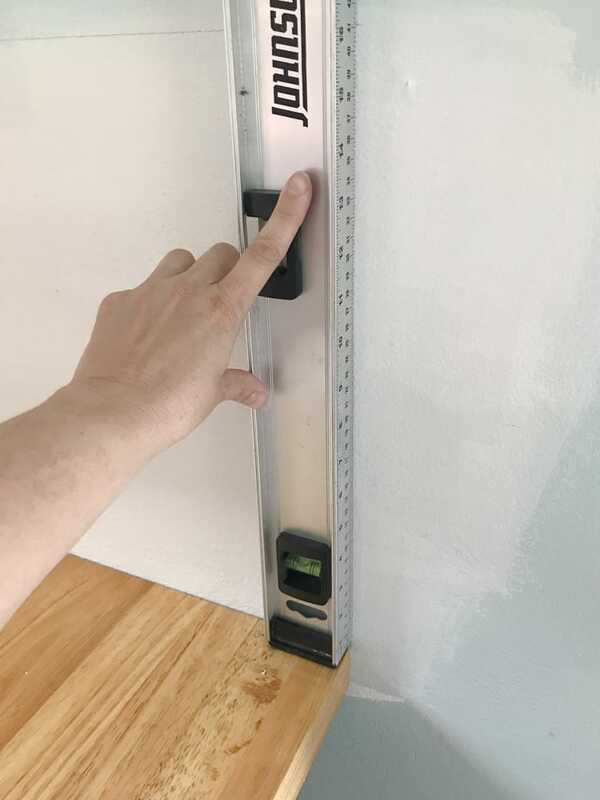 I actually did check it before I began, but the level I was using was not quite big enough to demonstrate the variance across the entire wall. 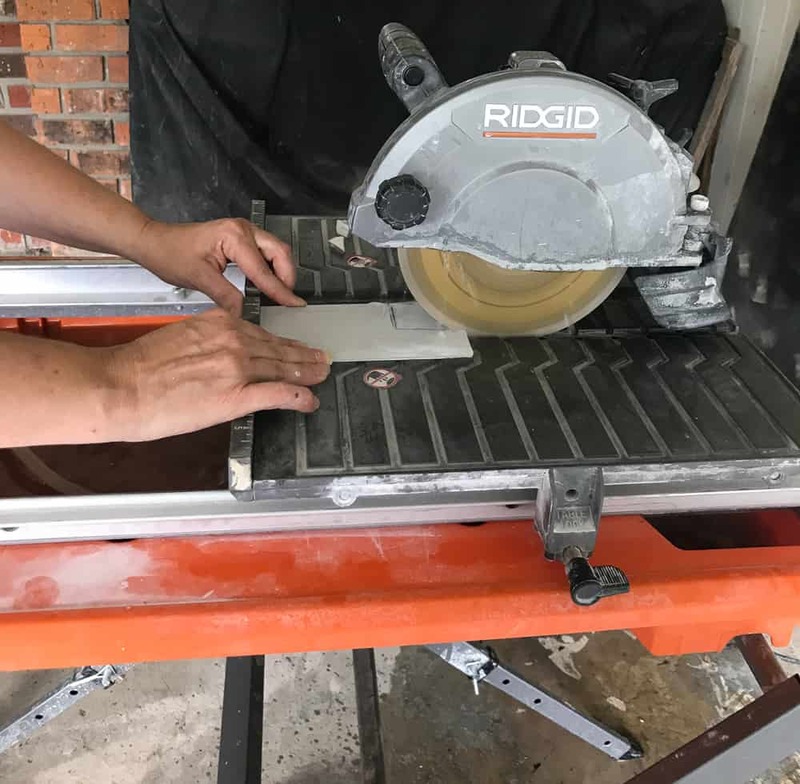 Cut tiles with glass cutting tool or wet saw. While these glass tiles could be cut with a simple glass cutting tool, I used a wet saw. This was especially helpful for notched cuts around outlets and switches. It was no different than cutting a regular tile. I just left the paper backing on the tile until I was done cutting. 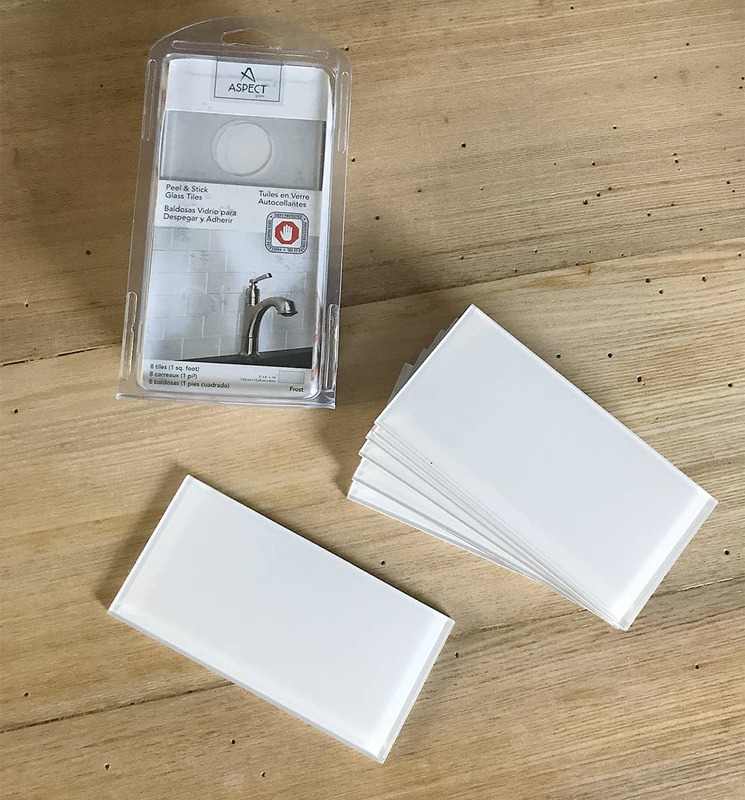 Add additional construction adhesive to cut tiles. 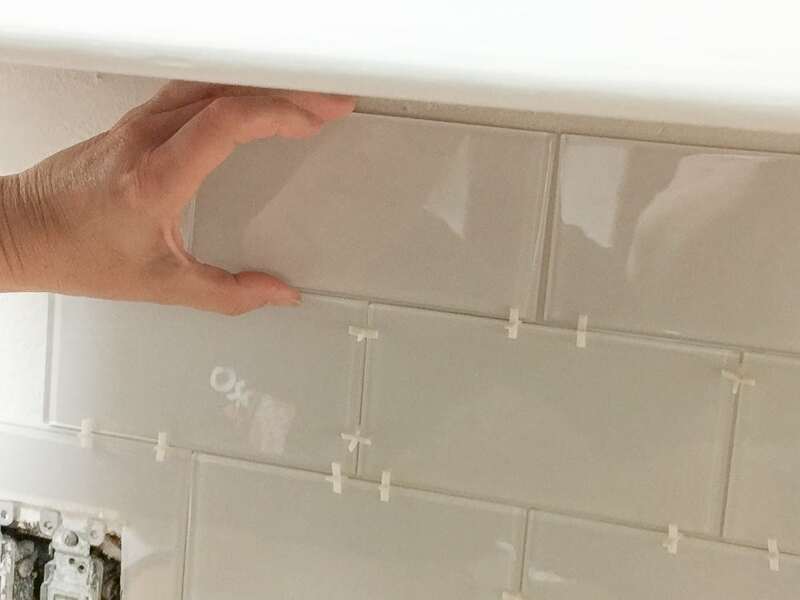 The manufacturer’s instructions recommend adding construction adhesive to the back of the tiles that are cut. We found adding a piece of painters tape to those tiles to keep them in position while the adhesive dried was helpful. Handle and set tiles with precision. After a few tiles, I got a feel for the best way to place the tiles and the spacers. The tiles adhere to the surface extremely well, so there is a bit less play than if you are setting tile with mortar. 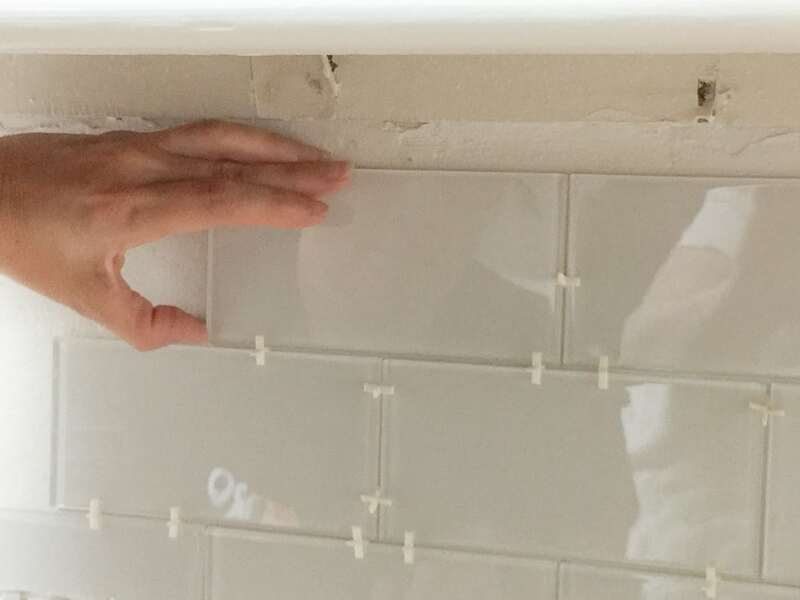 Place a spacer on the bottom row near the corner and set the tile on it lightly. Then add the upright spacer and push the tile tight to the neighboring tile. Then add a spacer to the far horizontal edge and glide the tile down to rest on the tile underneath. 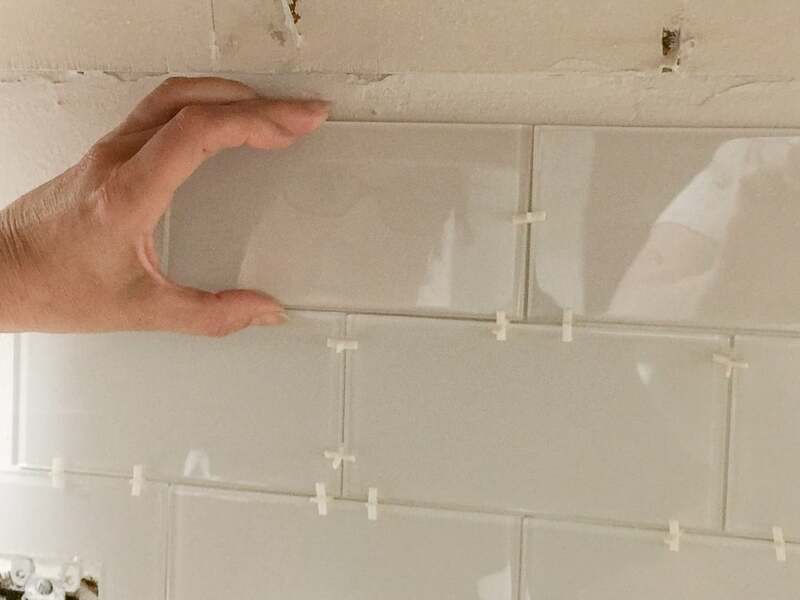 Be sure the positioning is accurate and push the tile firmly onto the wall. As extra insurance, we lightly tapped each tile with a rubber mallet. As directed, we allowed the tiles to set for 24 hours before applying the grout. 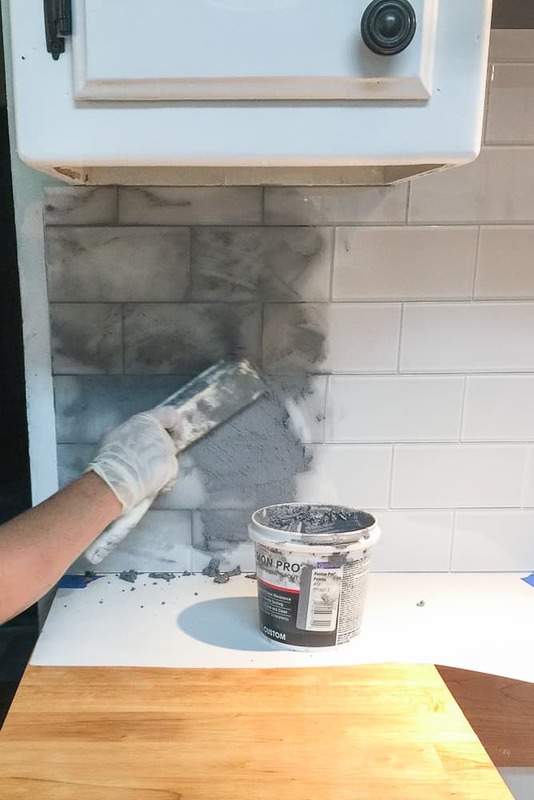 I like to use premixed grout like this one, and now that it comes in smaller containers, it’s perfect for these smaller jobs. I like to use a two sided spong for grout clean up. After about 5 minutes of work, wipe the tiles with the blue microfiber side of a sponge, working diagonally across the tile. Continue to wipe with the regular yellow sponge side until the tile is clean. The last, most important step is to lightly wipe the surface of the tiles with a microfiber cloth. This removes any last bit of haze. I try and keep the cloth only slightly damp, not at all wet. That’s it! The job was done and it was time for a little decorating! My favorite part. She was beyond pleased with how it turned out. She kept telling me how much she loved it and couldn’t believe this was “her” kitchen. Tiling the backsplash in this kitchen with peel and stick tiles took about a day and a half to complete, but the results are worth the time! The cost for the tiles and grouting materials was about $140. 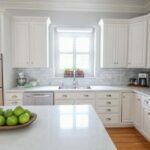 Aspect Peel and Stick Tiles are available online at DIY Decor Store or through HomeDepot.com and Wayfair. The glass tiles come in 12 colors. They also have a full range of stone and metal finishes. There’s sure to be something that suits your specific needs. Many thanks to Aspect Peel and Stick tiles for the contributions to this project and for sponsoring this post. 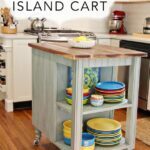 Want more great DIY Projects? Folow me on Piinterest here. 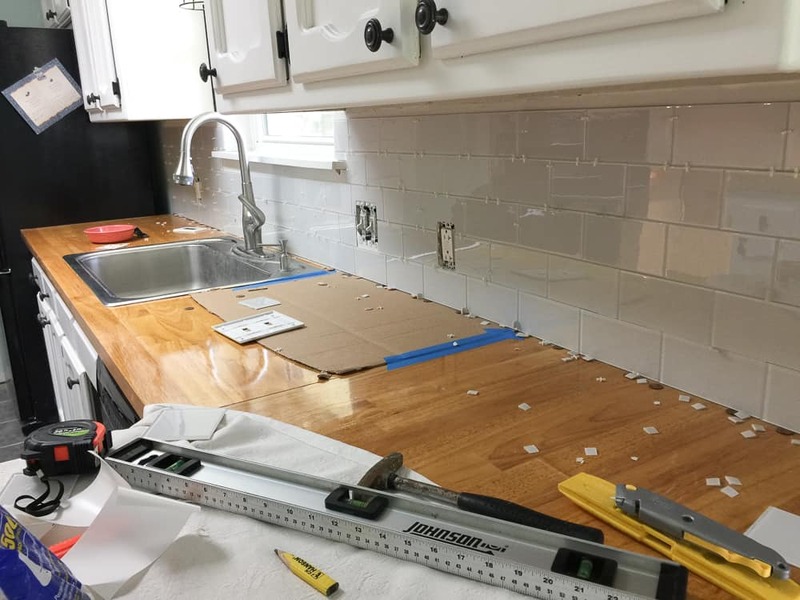 The backsplash looks fantastic! I am so shocked by the difference they made and I know your step sister was super excited with the results. 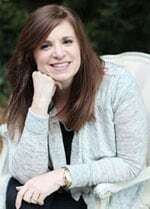 This job made a big difference in her day-to-day life. 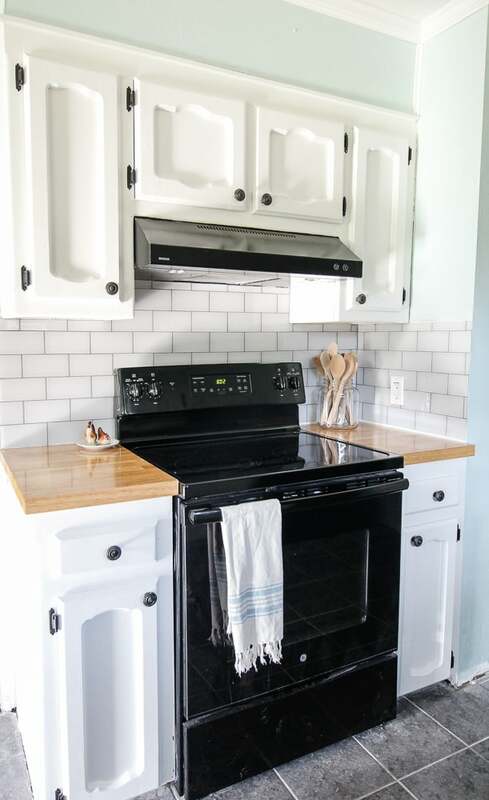 I am not ususally a fan of subway tiles but these glass tiles are beautiful! 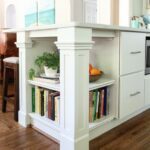 I have that ugly scalloped piece in my kitchen too so when I paint my cabinets it is coming down! I was worried it would be a big job aw well so thanks for sharing! Her kitchen looks so much more finished now! Great job! That countertop! Tell me more–I am in LOVE! I am pretty certain it is butcher block from Ikea that she finished herself. This turned out beautiful! I love the contrast of the grout against the glass tiles! I’ve got a box of it that I have yet use because the glass tiles alone had a bit too modern of a look for me. Grouting it will be perfect! Thank you! You are right! The goal was to make the more modern tiles look a bit more traditional. 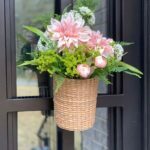 It still has the subtle bling which is just so pretty against the other rustic elements. Looks great! Do you happen to know the paint color?? Looks fantastic! 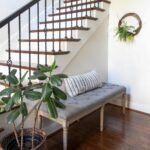 What are the benefits of using grout? I didn’t think grout was needed for peel and stick tiles for some reason, but I’m no expert! I used grout just for aesthetics. 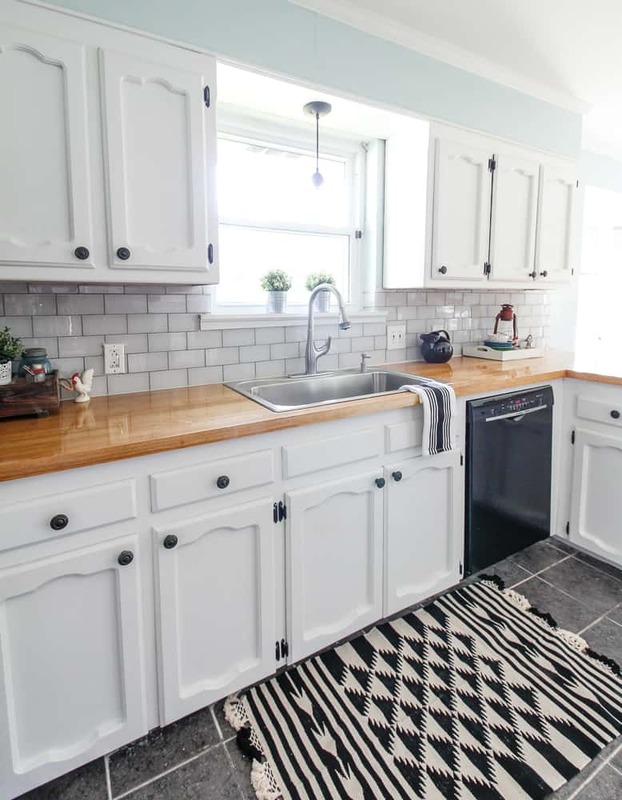 She wanted it to look more like traditional subway tile. You do not have to use grout though.